A monthly recipe using produce harvested from the Warriston site. An easy, seasonal treat that uses up all those brambles ranging around the plots at this time of year. The maple syrup brings one plot holder's connections with Canada to the table. Set oven to 180/Gas 4. Look out a small, deep pie dish or tin. 4 servings. Rub the flour and butter together into breadcrumb consistency, with cool, dry hands. Stir in the caster sugar and oatmeal. Set aside. Core and peel the apples—cut them at the last minute as they will go brown (you can squeeze some lemon juice over them if you want to stop this happening). Wash the brambles and put them at the bottom of the dish. 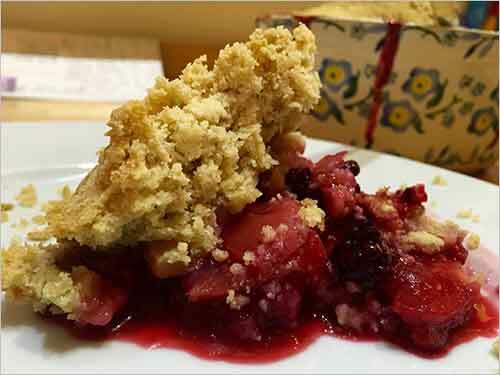 Place chunky slices of apple over the brambles and press down so that the crumble doesn't fall through too much. Pour over the maple syrup (or sugar) to taste (i.e. add more or less depending on your apple variety and your preferred sweetness). Add 2 tablespoons water to the fruit. Place the crumble on top of the fruit and pat down fairly firmly. You can make the crumble into a dome shape if you have a small dish and lots of crumble. Sprinkle the demerara sugar over the crumble for a crunchy topping.